Vessels can have many different impacts on the environment and are regulated under a number of different laws, rules and agencies. Contact: Pam Parker 207-485-3038. 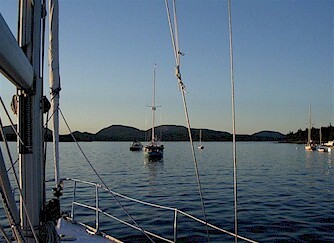 The Clean Boating Act of 2008 required the regulation of discharges of graywater, bilge water, ballast water, cooling water, drive shaft lubrication, and antifouling coatings among others which can contain a number of pollutants including bacteria, invasive species, oil and grease and pesticides to name a few. The US Environmental Protection Agency (EPA) regulates these discharges through a Vessel General Permit (VGP). The VGP requires use of best management practices as well as some monitoring to ensure that the vessels are in compliance with the permit. Recreational vessels and vessels of the armed forces are not subject to the VGP. The discharge of sewage (toilet waste) from vessels is regulated by the US Coast Guard and includes requirements for the installation of equipment that treats or holds the sewage (Marine Sanitation Devices), and through the establishment of areas in which the discharge of sewage from vessels is not allowed (No Discharge Areas or No Discharge Zones). Emergency Spill and Response. Information and emergency numbers from the Bureau of Remediation and Waste Management. Inland Fisheries & Wildlife: Boating Laws & Rules (off-site; request by email). Maine Department of Marine Resources (DMR) (off-site).